"This is the best bread recipe. Light and fluffy rolls that melt in your mouth. Can be used to make loaves or cinnamon rolls." Excellent rolls! I had to add more flour than called for. The next time I will make them bigger than walmut size. I also made some into cinnamon rolls. I like the dinner rolls better! 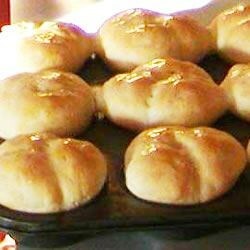 This is one of the best recipes for rolls that I have ever found they meltin your mouth and are wonderful. These rolls seemed like they were straight out of a restaurant. I cut the butter to 5 tbs and they still came out good.